Step Inside: Our Modest Car Collection! We don’t do this very often. Opening up Our Modest Car Collection to yahoos off the street, even if they’ve put on a faded Banana Republic polo and clutching a cheap notebook in some pitiful mockery of journalism, is a blessedly rare occurrence. But today, you, my friend, you are in for a treat! Because behind these hallowed, steel-plated, blast-proof, hermetically-sealed, temperature-controlled doors, you will see the fruits of 20 years of labored, passionate, and obscenely wealthy car collecting expertise. Please, wipe your feet. Here is your visitor badge. A quick retina scan and blood sample processing, and we should be inside in no time. 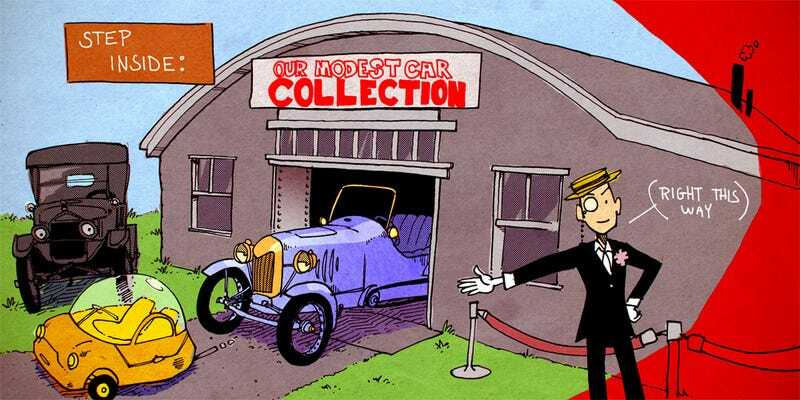 Step Inside Our Modest Car Collection! Our Modest Car Collection, of which you are about to gaze upon with the slackest of jaws, resulted from the tireless efforts of one Sir Pembroke R. Basingstoke, whose story is truly a rags-to-riches-to-rags-to-filthily-unspeakable-riches story. Sir Basingstoke was a penniless scamp when he floated across “the Pond,” as those sonorous Brits call it, and debarked in New York City—starving, inexperienced, and possessing a dangerously “foreign” accent. Through hard work, money laundering, industrial espionage, and a night spent in a mysterious mansion inherited from a previously unknown blood relative, our Basingstoke was able to amass a small fortune and dominate the explosive, limitless growth of 20th-century print media. With such riches to his name, he could afford to indulge in two of his life’s passions: motor-carriages, and compulsive hoarding. He indulged in all there was about Americana: he purchased Chevys, Chryslers, ‘Cudas, Cobras, Cougars, Cyclones, Cherokees, Concordes, and even the occasional Citation X. And in true Continental civility, it was he who gave our modest car collection its modest name. Sadly, he passed on a few years ago, when his restored Voisin biplane plummeted into a nearby freeway like a French Icarus. But his legacy lives on! Right through these doors, in fact. We’ve got such classics as the Scab-Ruxpin Baltimore, the Fassaratti Pavaratto OU-812 Ossobucco, the world’s nicest Scorpio Wrekkr “X-Treme” 707 this side of a Las Vegas impound lot, and who could forget the legendary Yamazaki Kizashi TRA-T of 1989, the car that revolutionized the car industry, at least the grossly inefficient part. Let&apos;s begin our tour with a 12-seater runabout built by a maniac. This car is notable in the sense that where most runabouts have just two seats and are built for speed, the Frothmobile had twelve bus-style bench seats and a top speed of 5.8 miles per hour. At the time, it was actually faster for all twelve passengers to get out of the car and push. Back then, it must be said, people were in a lot better shape and far more used to hardships like this. Of course, Mr. Franklin insisted on calling his cars runabouts to drive up sales, though as a staunch Protestant he was dismayed to find that his cars were frequently purchased by the Irish. True to its “Deluxe” moniker, the mink fur stitching on the reciprocating magneto is in fact real. Our Modest Car Collection is remarkable in its scope, as well as its breadth. Take this 1968 Scab-Ruxpin EVZ-26 “Baltimore,” possibly the only car to be built in that great City by the Bay, actually right under Memorial Stadium, in fact. During `the off-season a group of six disgruntled GM engineers, who belonged to a secret corporate cabal of Ralph Nader supporters, took refuge under home plate to design a car that would successfully represent the safety hysteria of the 1960s. Our Modest Car Collection: 1968 Scab-Ruxpin "Baltimore"
There aren’t many five-wheel cars around, but the two wheels mounted on the roof ensured that the car could keep driving even if it flipped over. During testing it not only rolled over three times when its parking brake caught fire, but it kept driving! Sadly, the Scab-Ruxpin outfit ran out of money almost immediately, owing to the difficulty of forming the single-piece Astrodome roof, which was also prone to attracting seagulls. But there is a happy ending to this story. Ornithologists at Johns Hopkins have the Scab to thank for furthering their research on the diets of waterfowl, whose scatological samples were collected by the dozens from the Scab’s body panels. But wait, as they say on TV (or as our esteemed founder Sir Basingstoke said, “that bloody whinging telly”), there’s more to Our Modest Car Collection. Here is one of the jewels of our collection, and one of the most expensive cars we own: our 1990 Fassaratti Pavaratto OU-812 Ossobucco. Fassaratti was one of the great prewar brands of Europe, and they built some of the most beautiful cars ever to hit the road, cars that pushed the boundaries of art and sculpture, good taste and phallic beauty...one need only to turn to the 1937 Fassaratti RLX-126 Armadio, with its rounded, mile-long hood and rear wheels pushed as far back as possible, to envision true automotive beauty. Or the TFC-80 Vaffanculo of 1938, a slinky two-seater coupe bodied by Saoutchik and supposedly named after the expression young Rudolph Valentino would shout at waiters. Or the 1939 Fassaratti TVC15 Ferro Arricciacapelli with coachwork by Rimessa di Léno, an iconic three-wheeler, of which the Shah of Iran owned twelve. After the war, the brand lay dormant until Italian entrepreneur Luigi Fieri (no relation) bought the rights to the brand in 1985 and began developing a new supercar that kept up with contemporary trends. Thus, the windshield is made up entirely of color televisions. The front bumper is so sharp, in fact, that you can cut a sheet of paper along it. And for a while, this was the fastest car in the world: its quad turbo-superchargers produced 707 horsepower, and it could hit 60 miles per hour in just 2.9 seconds, right after they put out the fires. Fieri went to prison for grotesque tax evasion, where he remains today. But they say Fassaratti is working on an even more extreme supercar, one that will spontaneously combust less. But, well—you can’t top a legend. Blake Z. Rong is an occasional contributor to Jalopnik and points in between. Our Modest Car Collection is a mildly entertaining new series appearing weekly at Road & Track. These cars do not exist. You Could Say That I&apos;m A "Car Guy"